The Merry metallophone delivers bright, lyrical melodies and is precision tuned to play in-harmony notes every time. 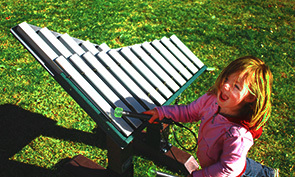 Drawing upon inspiration from the full-sized Pegasus Metallophone, this diminutively designed outdoor musical instrument features 11 resonating anodized aluminum keys and resonator bars in a compact HDPE frame. 2 rubberized mallets come standard and attached to the frame by stainless steel nylon coated cables. Merry is available in specific configurations to accommodate portable, in-ground or surface mount installations. This distinctive musical playground instrument is built to maintain its structural integrity and ready to provide lasting enjoyment for all ages and abilities, regardless of musical training or experience. Merry is perfect xylophone companion to the Piper Marimba. 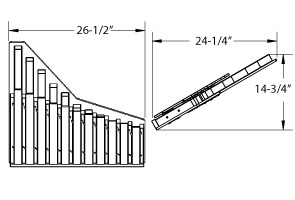 Ensembles instruments are specifically configured for protable, in-ground or surface mount installation, the recycled plastic and steel post mounts are factory cut for Adult or Toddler 'Finish Height'. The in-ground mount posts are ready for subgrade installations with 36" length for 'Frost Depth'. Actual Post Length = Finish Height + Frost Depth. Recycled plastic post can be easily cut to custom height in the field.